Since its foundation by grocer Lawrence Sheriff in 1567, Rugby School and its pupils have made their mark on the world. Rugby is the School where William Webb Ellis picked up the ball and ran, where Dr Arnold became the leading Head Master of his age, where Tom Brown endured torment from Flashman and where Lewis Carroll spent his formative years. Today, the School remains one of the world's leading co-educational, independent boarding schools giving young people a unique opportunity to fulfil every part of their potential, intellectually, morally, spiritually, physically and socially. True to the spirit of its founder, Rugby through the Arnold Foundation also leads the way in providing bursary opportunities to students from every walk of life. 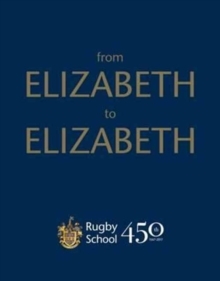 Through from Elizabeth to Elizabeth we get a glimpse of how the School has evolved over four and a half centuries and where Rugby's own story sits alongside the wider history of the world.